Powerful stuff Shull . May it never happen. Even in nightmares. Fecking great, this pish has even polluted the sin bin!!!! A new Celtic Topic coming soon. Hopefully Ayr and St Johnstone fecking hump the sectarian cnuts tonight. Hat tricks from Shankland and Watt would be welcome. Although anybody scoring winners against the Bigots would be marvellous. Hello Hello They Are The Ayrshire Killie Boys. Hope they hump sectarian Celtic today. Only one word can describe Celtic fans at Kilmarnock today and that is total scum. First hit boyd with a coin (on the plus side at least he didn’t go down like he had been shot). 2nd of all the flares. 3rd pitch invasion and whilst doing this they think it’s a good idea to jump on the roof ( basically just a sheet of light tin) of the Kilmarnock disabled section which had young an older wheelchair users many with different and complex disabilities. And last of all when my wife was trying to pick up my son and her friend from the game the so called best fans in the world felt it was ok to bang on the car rock it from side to side whilst she was in it with a 14 year old girl. The police what did they do emmm let’s see what they normally do sod all. Now it’s time to go tell a 13 year old boy a life long killie fan through the good times and bad times that sorry son when Celtic comes to town you will have to stay in the house to watch the game. Hopefully he understands that it’s for his own safety cause could you imagine that wee tin roof collapsing and someone landing on top of him. Well doesn’t bare thinking about. Cnut never says a word regarding sectarianism, bigotry and fecking hatred in the Game. The Board of Kilmarnock Football Club wishes to express its dismay at a number of events which occurred during yesterday’s game against Celtic. 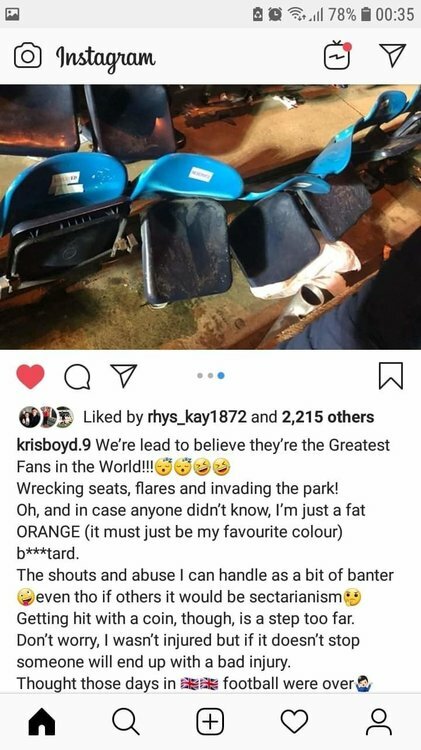 During the course of the match our club captain Kris Boyd was struck by a missile thrown from the crowd, a number of Chadwick and Moffat Stand seats were damaged or broken while some Celtic supporters invaded the field of play and confronted our players. We condemn all of these incidents in the strongest possible terms and reiterate that the safety of all players, staff and supporters is paramount at all times. 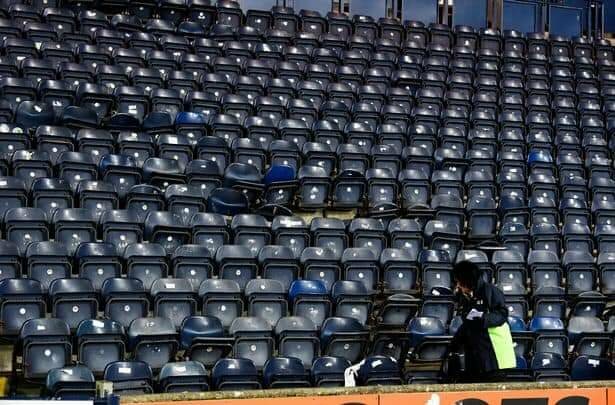 Under SPFL Rule H40, Celtic FC will be required to pay for the damage caused to Rugby Park. Over the course of the day, initial investigations have begun and we will be seeking meetings with Police Scotland and G4S. Kilmarnock FC is a family club and as a board we continue to work hard to ensure Rugby Park is a safe and welcoming environment for families to enjoy watching football. They looking at only giving ugly sisters 1 end of the ground? HELLO HELLO COME ON THE AYRSHIRE KILLIE BOYS. SEVCO2012 GOING FOR THE TREBLE ZERO. Super Killie to win 3-1. I am also guessing there is going to be very serious cheating tonight involving Sevco players and the Referee. Hopefully, Killie will still triumph. No way do Sevco want foreign refs with the great advantage they have at the moment. Celtic will only be happy with a foreign Referee in their games v Sevco. And that Ref.will need to be from Eire or Palestine. Yeah unfortunately we have recently lost the right to condemn the fans of other clubs. 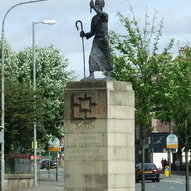 I can condemn who I want, whether it is scum Saints fans or sectarian Celtic fans. I spat on nobody and neither did all St Mirren fans bar 2 or 3 arseholes. Paranoid Celtic and Paranoid Sevco only crave foreign refs when they are playing each other.